I arrived a bit late to the first wedding of two only to get trapped in the parking lot due to idiots who had parked every which way Undeterred, I squeezed through a couple of pickups to a promising dirt field that appeared to be damp, but solid. 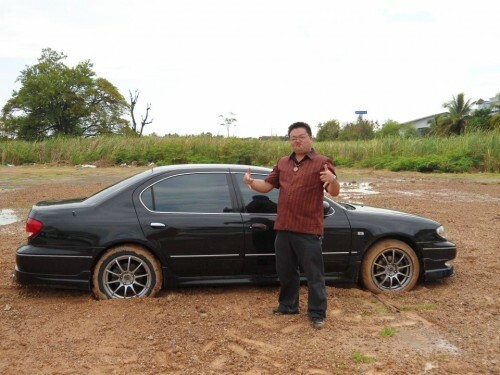 A couple feet into it, the car bogged down a bit, but not wanting to get stuck, I pushed forward… and got stuck further into the field. 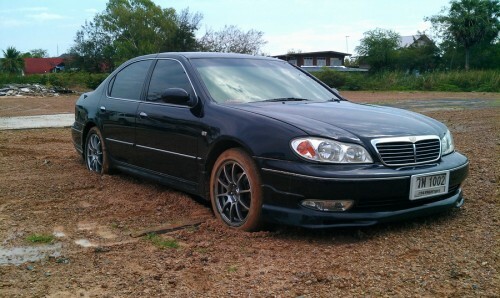 Eventually, a truck came and pulled our trusty Cefiro out of the muck, and I took it to get washed before Nam came home. By the way, this is the semi-finished parking lot at the new wedding hall of Marin restaurant in Maha Sarakham.